No, I don't plan to have a baby anytime soon. 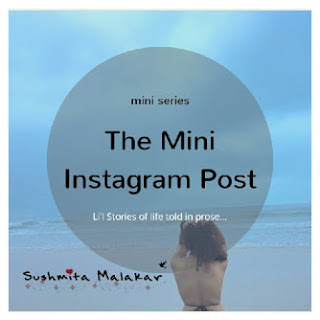 But somehow, I feel that I have been, off lately, compelled to observe and work very closely with kids. The super cute stage set up! The exclusive launch of the premium range of Pamper Pants took place in Delhi on the 22nd of August at The Vivanta by Taj. The new born with whom I spend a lot of time nowadays is a cloth baby. We tried on diapers on him on the very first day but then he wont stop crying. So it was decided by the granny that let us keep him in cloth for few days now. Was the diaper pampers? No. No mom can see her baby uncomfortable and crying. That is the reason the babies get the diaper free time because their skin breathes a sigh of relief then. 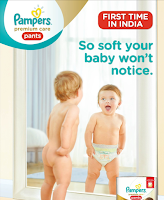 The new range launched by Pampers promises the same comfort. 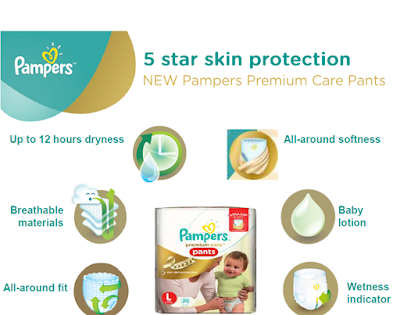 Pampers understands the importance of healthy and soft baby skin which is too sensitive. The new premium range have an all-around soft waistband and great dryness that absorbs wetness and locks it away, meaning Pampers Premium Care Pants will keep baby’s skin dry and comfortable. And, the new pants form means you can change your baby so easily, he can barely feel being changed! The unveiling of the product was done by Actress & Celebrity mother-Tara Sharma, Child sleep consultant-Ajita Gopal Seethepalli, Pampers R&D Expert – Dr. Wei Sing Long and Actress & Television presenter-Mandira Bedi. A sound sleep is necessary for the holistic development of a toddler. A comfortable sleep is what this product promises apart from the freedom movement without the irritation of damp and wet skin. The experts panelist talking about everything that has babies in it! Pampers is the most preferred brand. 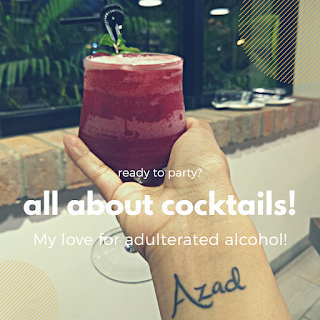 And I believe that with this new range launched in India, they are going to maintain the position that they have in the mind of the mommies! So what does it promise to deliver? The R&D expert, Dr Wei Sing Long demonstrated all these features. The all round softness test in progress. 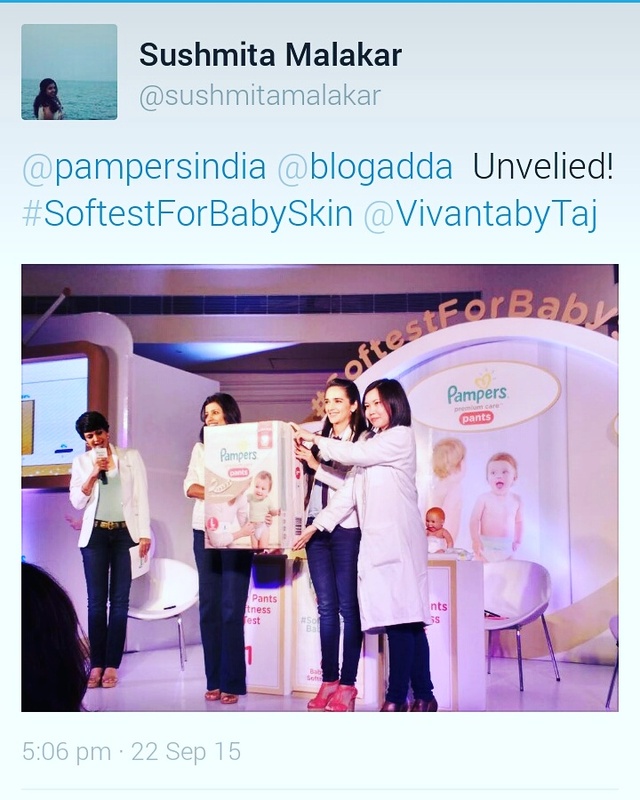 All the attendees were asked to use the sensation of touch to identify the softness diaper in the test box. A whooping 80% of the audience voted for the slot number 2. And no points for guessing, it was the most trusted, Pampers! Then there was the sensitivity of the lotion that was being used in preparing the diapers. Pretty impressive the patch test was! The yellow paper in Tara's hand is the paper that imitate's a baby's skin. Yellow patch is the area treated with the lotion after exposed to a chemical of same pH as that of a baby's pee. And of course, there was the miraculous dryness test. The dryness test was the pretty convincing of all. But how good and true are they really? I will get back to you on that in some days after my cotton ball's mommy uses the new range.